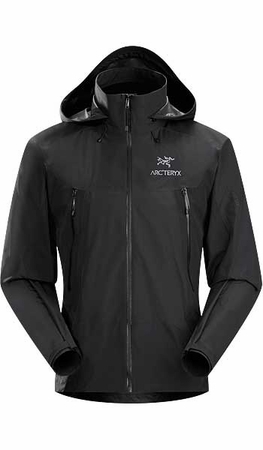 The most packable and supple jacket in the Arc'teryx Essentials collection; constructed using GORE-TEX® with Paclite technology in the main body, and reinforced with GORE-TEX® with 3L tricot technology in high wear areas. A highly versatile GORE-TEX® shell that effectively combines lightweight packability with emergency weather protection. Body mapped to put the right material in the right place, GORE-TEX® fabric with Paclite technology is used in the main body to minimize weight and increase packability. Key wear areas utilize 3L GORE-TEX® with tricot technology to boost durability. The DropHood™ pulls snug for increased visibility; WaterTight™ zippers minimize material use and create a streamlined profile. High wear areas are reinforced with hardwearing textiles at abrasion points and high stress areas. The Beta LT Hybrid Jacket puts N40p GORE-TEX® 3L with tricot technology at the shoulders and under the arms, areas particularly vulnerable to wear from pack straps. N40r GORE-TEX® fabric with Paclite product technology weighs a mere 3.4 oz/yd2 (114g/m2). Used in the jacket body to shave grams without sacrificing weather protection, this waterproof/breathable, incredibly light nylon fabric utilizes a mini ripstop construction for increased tear strength. Anatomical shaping and ergonomic patterning combine for fit, comfort and maximum mobility. Gussets under the arms to allow the arm to flex without the sleeve riding up, and the cleverly designed DropHood™ cinches securely to move with the head, increasing freedom and peripheral visibility. This attention to freedom of movement is a focal point of the Arc'teryx commitment to highly functional design.